Launched in 2015 by the U.S. Forest Service and supported by Kenyan partners and the Center for International Forestry Research (CIFOR), the three-year Kenya Water Towers Climate Change Resilience Program aims to support strategic planning to strengthen and enhance the climate change adaptive capacity and resilience of Kenya’s water tower ecosystems. The program focuses specifically on the Mau Forest, Cherangany Hills and Mt. Elgon ecosystems, three of the five largest water tower ecosystems in Kenya. These tropical montane ecosystems are critical to the country, as they are major water sources and biodiversity hotspots. However, while communities understand the importance of these landscapes, there has been widespread degradation and deforestation, in part driven by the communities’ livelihood needs. In February 2018, the first two points listed above were completed and their findings released while a draft monitoring framework has been developed in collaboration with various stakeholders, including the Kenya Forest Service, Kenya Forestry Research Institute, Water Resources Authority, Kenya Wildlife Service, Kenya Meteorological Department, Kenya Water Towers Agency, and the Regional Center for Mapping of Resources for Development. In partnership with East Africa’s Intergovernmental Authority on Development’s Climate Prediction and Application Center of the (ICPAC), the program conducted a climate change vulnerability assessment (CCVA) of the three water tower ecosystems. The study adapted the IPCC4 framework that defines vulnerability as an amalgamation of exposure, sensitivity, and adaptive capacity. Over the course of two years, research conducted for the CCVA found that, under different emissions scenarios, temperatures in the three ecosystems could rise by up to 5 degrees Celsius by the 2070s. At best, under the low-emission scenario, which is reflects Paris Agreement commitments, the increase would fall between 1.4 to 2 degrees, which – in conjunction with an expected overall decrease in rainfall – is still significant. Of the three ecosystems, Mt. Elgon was found to be the least vulnerable to climate change, though its seasonal rainfall is expected to shift most heavily (from March–May rains to October–December). Temperature changes are critical in the water tower ecosystems. The Mau ecosystems experience favorable microclimate conditions suitable for growing tea – a high-earning export. Less rain and changing rainy seasons can result in crop reduction or failure, flash flooding and drought, as well as less reliable water yields for users downstream. This can have major detrimental effects on hydropower production, livestock, economic activities and health of local communities. Resulting recommendations from these findings include increased use of agroforestry and reforestation, adoption of drought-resistant crops, adapting cultivation seasons, improving irrigation efficiency and implementing payment for ecosystem services to incentivize communities to implement these recommendations and others. Implementing these restoration activities are important for improving water availability and sustainability, to support the Big Four. In partnership with the Kenya Forestry Research Institute (KEFRI), a Total Economic Valuation (TEV) of the ecosystem was undertaken and services were classified into regulating, provisioning, cultural and supporting services. The TEV of the three towers was calculated to be USD 3.4 billion annually, accounting for almost 5% of Kenya’s 2017 GDP. Within the TEV, regulating services – namely hydrological services, soil protection and carbon sequestration and gas regulation – contribute a much higher economic value than do provisioning services. However, in terms of benefits obtained, local communities rank provisioning services – e.g. water, fuel wood, construction materials and natural medicines – as having more perceived benefits than regulating services. Together, the three water towers provide 80% of raw materials going to support more than 250 sawmills that employ more than 35,000 people. The towers are also the main source of hydropower electricity and support the irrigation of more than 52,000 hectares of agricultural land. While quantitative data on actual economic benefits, could not be accessed, water flows from these ecosystems feed biodiverse landscapes and national parks that support the national tourism industry (contributes an estimated 8% to Kenya GDP). Ecosystem monitoring is important for tracking water tower ecosystems, in order to inform strategic planning and decision making on environmental management for human wellbeing. The EMF includes six monitoring themes: soil and water, forest resources, biodiversity, wildlife, human wellbeing, and governance. Agencies collect and store data and information on the water tower ecosystems, yet there is currently no system for data access and sharing, making it difficult for informed decision making across community, county and national levels. The program recommends improving data access for users. Local communities understand the value of the water tower ecosystems, as shown by the high value the communities place on the services the ecosystems provide. Challenges come primarily from the unavailability or lack of incentives to utilize alternative sources of livelihoods, which would reduce pressure on forests. The key to preserving these three water towers in part lies in communicating their immense value to policy- and program-makers, including County governments. 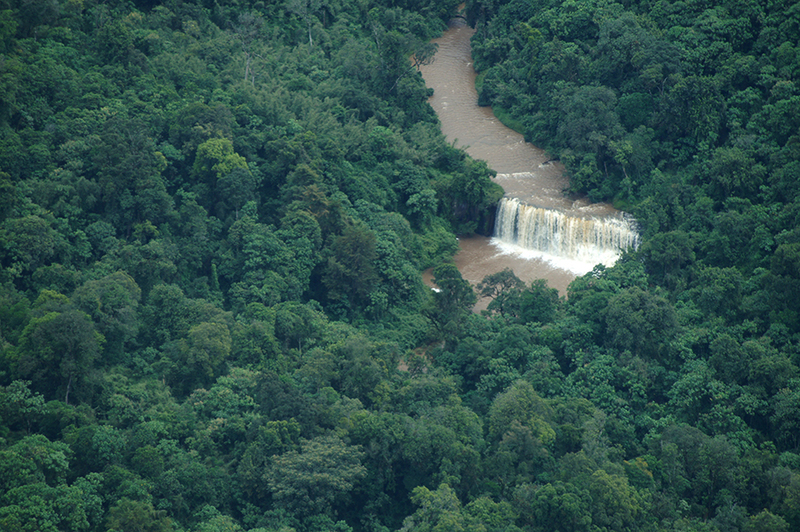 The Ministry of Environment and Forestry has prioritized a wide range of actions to conserve and manage these ecosystems, including the recent creation of a forest sector task force, but more can still be done to ensure sustainable management and conservation of the water tower ecosystems as they form an important pillar for the achievement of the Kenyan Government’s Big Four development goals. Improving data collection, storage and sharing; advocating for more green infrastructure around these landscapes; continuing to conduct mapping; increasing engagement with industries such as tea companies and hydropower companies to develop finance mechanisms that recognize the value of the water towers and their stewardships. Ongoing program activities include finalizing the Ecological and Socioeconomic Monitoring Framework and synthesizing the findings from the all program activities into a focused Ecosystem Management Strategy. Feedback and outreach activities to share program outputs have also begun, and will include consultative forums to discuss strategy development. The strategy will contain specific mechanisms, built with local communities and county governments, to enact restoration activities that benefit local communities. For more information about CIFOR’s research on water towers in East Africa, visit here.